This is a Hodiamont streetcar going westbound on Olive at Compton. 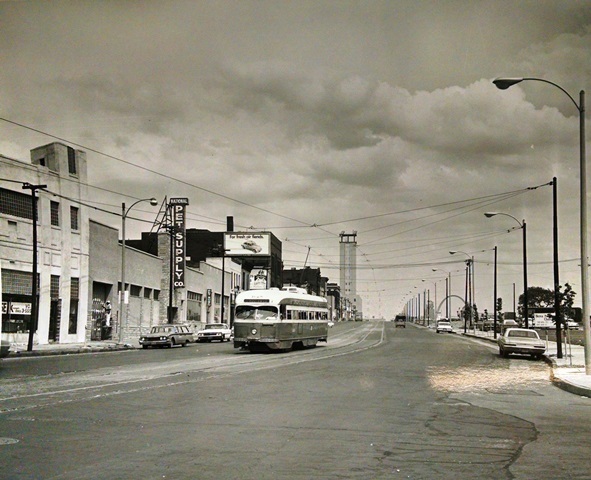 The top of the Arch in the background is the giveaway that the photo was taken in the mid-1960s, after the arch was topped out in 1965 and before the Hodiamont line’s final run in 1966. There is plenty going on this weekend near this photo’s location in Grand Center. You can ride Metro to see Bob Dylan at the Fox Theatre or check out a special event Circus Flora And “Calder Circus” at the Pulitzer Arts Foundation.